Friday nights are often steak nights around our house – we have steak in the freezer, so we don’t have to go to the store, plus it’s both easy to cook and festive to eat. Last Friday we were racking our brains trying to think of something to go with the steak we’d pulled out to thaw, and eventually J came up with an idea for pasta mixed with fresh herbs and breadcrumbs. Sounded good to me! J did most of the cooking for this dinner – he trimmed and seared the steaks, picked and chopped the herbs, sauteed the breadcrumbs and chose the wine. I helped season the meat, boiled the pasta and stirfried some spinach to go on the side. 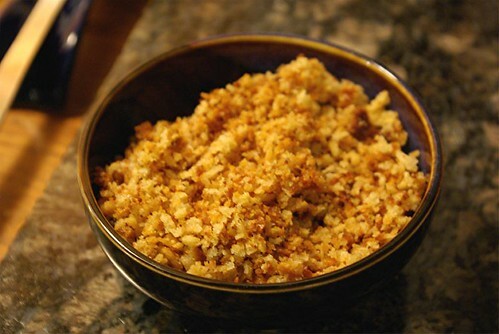 The pasta was very simple – rotini cooked al dente, then tossed with olive oil and chopped fresh rosemary, thyme and sage, and served with breadcrumbs cooked with oil and garlic until golden and crispy. Yum. The other fun thing J threw together was a compound butter for the steak. He let butter soften, then worked anchovies into it, pressed it into a small packet and froze it. 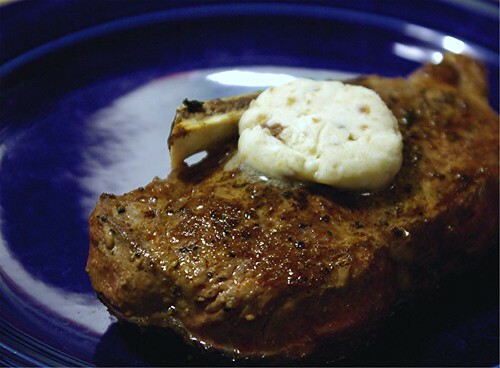 When the steaks were done, we cut the butter into two pieces and laid them on top of the meat. It worked well, although I liked the anchovy butter on the pasta more than I did on the steak. It all got mixed up together, anyway. 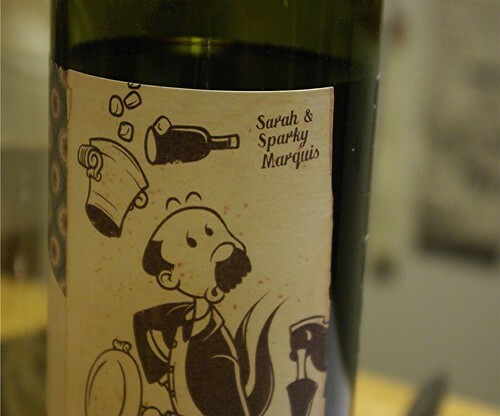 I was hankering for a cabernet, so J brought up a bottle we’ve been holding onto for a while, one of the Mollydooker series from Sarah and Sparky Marquis of Australia – the Maitre D’ Cabernet Sauvignon. We were very into Marquis (previously Marquis-Phillips in this country) wines for a time, especially after we had the chance to meet Sarah and Sparky themselves at a tasting here in town. The wines are pretty much all fruit bombs, big and juicy. I’m not always in the mood for that style any more, but it worked well for this meal and tasted friendly and comforting to me.